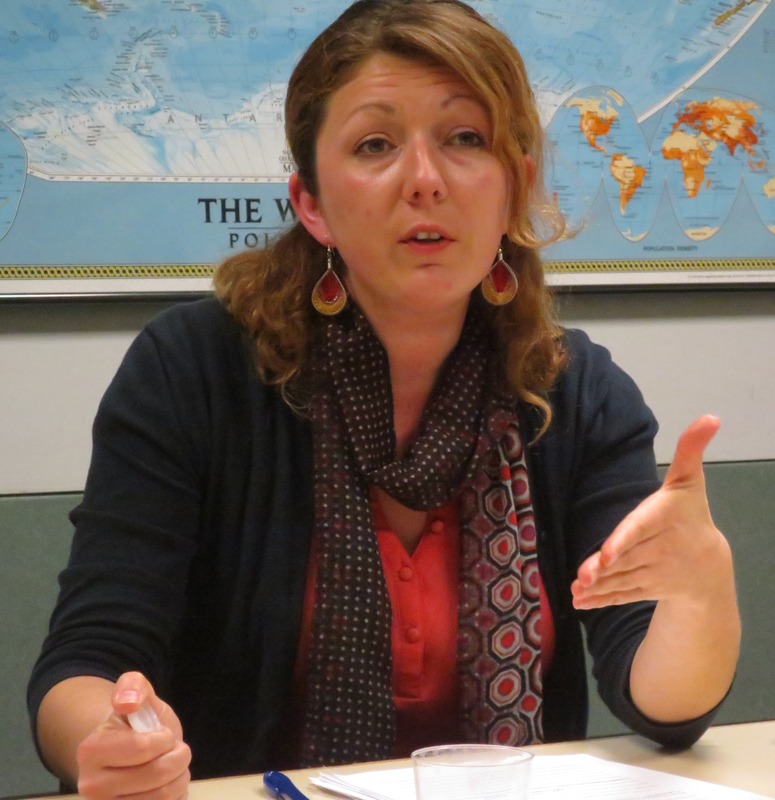 On April 7, 2015, Veneta Ivanova, Ph.D. Candidate in History at the University of Illinois, delivered the REEEC Noontime Scholars Lecture entitled “From Occultism to Science: Suggestology and Parapsychology Under Communism,” which discussed the scientific study of parapsychology, the investigation of paranormal and psychic phenomena, in socialist Eastern Europe. Beginning in the 1960s, parapsychology came under increasing scientific study in several Eastern European countries, especially Bulgaria. Consequently, the number of centers studying telepathy rose. These parapsychology centers combined the cultural and spiritual spheres with hard science. In her lecture, Ivanova sought to address the following questions: How could spiritual science be pursued in a socialist materialist system? What were the social, cultural, and political causes of spiritual science’s rise in the 1960s? What is the relationship between communism and parapsychology? In October 1966, a parapsychology lab opened in Bulgaria, which aimed to scientifically explain telepathy and clairvoyance. It later expanded into a national scientific group, the world’s first dedicated to the scientific study of suggestion. Vanga, a famous Bulgarian clairvoyant, became an important subject of the lab’s study. The lab’s scientists daily examined her brain functions and her processes of clairvoyance. In addition, Vanga was the first clairvoyant, of any country, to be on the state payroll. Though visitors to Vanga came from all social classes and backgrounds, local, regional, state, and Communist Party authorities had priority access to the lab’s services, specifically consultations with Vanga. The rising popular demand for her services underscored the institutionalization of parapsychology in Bulgaria, where the state funded and actively participated in it. Belying socialist Bulgaria’s officially atheistic and materialist doctrine, a close spiritual bond came to exist between the practitioners of parapsychology and high government officials, including Lyudmila Zhivkova, the daughter of Bulgarian Communist Party leader Todor Zhivkov. Visits to Rupite, a village in southeastern Bulgaria where Vanga lived, became part of the official delegation. Such privileged access meant it became almost impossible for ordinary citizens to consult with Vanga. Although the government openly sanctioned parapsychology, Bulgarian intellectuals proclaimed to be close friends with Vanga to indicate their cultural sophistication and their dissidence of state materialism. According to Ivanova, the late 1960s was a key period of the nationalization of Vanga, linking her to the state. She simultaneously became a subject and an object of scientific inquiry. Not only did Vanga become an important figure, but the 1960s, in general, was a period of heightened popular interest in parapsychology as well as spirituality, mysticism, occultism, and the paranormal – all part of a burgeoning New Age movement. Although scientific studies on psychic phenomena occurred in the Soviet Union and Eastern Europe much earlier in the 20th century, they stopped in 1937 in order to emphasize materialism. The Cold War provided a crucial context for reviving psychical research in the 1960s. The study of parapsychology was an area where the socialist states, especially Bulgaria, were more advanced than the West. Moreover, Ivanova pointed out that in late socialist Bulgaria, the doctrine of philosophical materialism, once a crucial part of communist ideology, was only paid lip service. There was a considerable degree of openness and debate permitted in discussing parapsychology, which appealed to the general public. Under communism, research on parapsychology flourished and became consolidated; the standing of parapsychology became solidified. Ivanova argued that the growth of scientific establishments studying parapsychology happened so rapidly because the interest in the field fell in a favorable environment. Many people regarded parapsychology as a legitimate science that did not run counter to material science. It was linked to physiological laws and operated according to laws of behavior. Furthermore, during the 1960s, the study of telepathy occurred within mainstream science and appeared in traditional scientific journals. The majority of scientists supported the study of telepathy, and scientists from all over the world attended symposiums and conferences on parapsychology in the Soviet Union and Eastern Europe. Even Bulgarian schools used suggestology for pedagogical applications, and it became the primary method of instruction. However, by the 1970s, public access to extrasensory perception (ESP) research closed in the Soviet Union. Bulgaria continued studying parapsychology, but attitudes had noticeably shifted. The discourse turned westward, emphasizing the strategic potential (such as collecting intelligence) of parapsychology. Anxiety about the military and strategic uses of ESP, particularly since the West deemed Soviet and Eastern European knowledge of parapsychology as superior, led to vigorous research in the United States and Western Europe. Stanford University, the Central Intelligence Agency (CIA), and the U.S. Department of Defense were some places that conducted the research. Ivanova’s lecture was a fascinating and compelling study, challenging the assumption that socialist Eastern Europe was only concerned about the material world. She contextualized the growth of both the study and appeal of parapsychology in Bulgaria and Eastern Europe, particularly its connection to state authority. She analyzed the political, social, and historical reasons for how parapsychology became an important feature of late socialist life. This entry was posted in Center E-News and tagged Bulgaria, History, New Research, Speakers. Bookmark the permalink.